Have the Happiest Birthday Ever ML!! Happy Birthday to ML, and yoor daughter-bean (hat a beautiful pic it is). What a purrty, purrty d-bean you have! We send her birthday wishes. We're wishing ML a very happy birthday too! And a happy birthday to your lovely daughter bean...We hope she has a fantastic day! Happy Birthday ML! Happy Birthday to the daughter-bean!!! A big Happy Birthday to the daughter bean. WE hope she has a great day and many more. Happy Purrthday to yoor bean sisfur! Hi Samantha and Clementine, we gots mom to sit fur an hour and leave some comments to our frends we'z been missing! 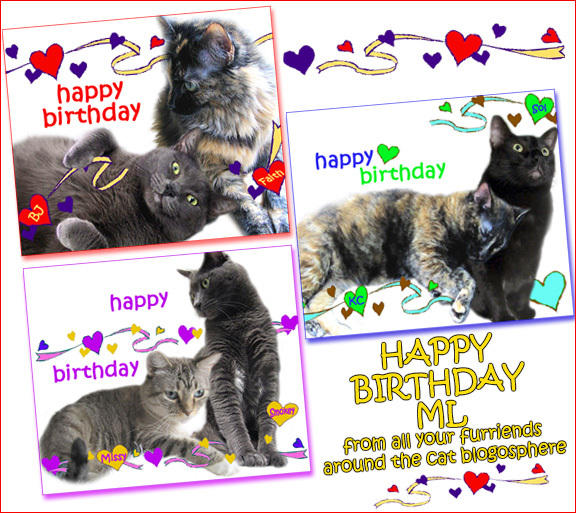 Wishing a Happy Birthday to your bean ML, and all that celebrate today!